The Money Quest: Fixed Vs Floating - Which is a Better Home Loan Interest Rate? Fixed Vs Floating - Which is a Better Home Loan Interest Rate? Every potential house buyer opting for the home loan is faced with the classic dilemma: whether to go in for a fixed rate or a floating rate. Unfortunately, there is no straight answer. Decision has to be taken after weighing the pros and cons of both the alternatives. Before resolving this issue, let us first know what is the difference between a fixed and a floating rate of interest and what is their impact on the borrower. Under the fixed interest rate loans, the rate applicable on the date of disbursement remains fixed during the entire duration of the loan and you are insulated from the market movements and spared the headache of tracking interest rate changes. Since the interest rate remains fixed, your EMI (equated monthly installment) stays the same. Whereas in case of floating rate loans (also known as variable, flexible or adjustable rate loans), lender (bank/HFC) has the flexibility to change it in line with the rise/fall in costs of funds which in turn depends upon the market rates of interest. In India, the floating rates are linked to the reference rates which are internal benchmark rates (generally the PLR) of the respective bank/HFC. The change in interest rate is reflected either in the EMI or the tenure of the loan. Depending on the interest rate changes in the economy and consequently the internal benchmark rates of the respective bank/HFC, the EMI or loan tenure can fluctuate. In other words, the basic difference between fixed and floating loan interest rates is that in case of fixed rates the interest rate risk lies with the bank and in the case of floating rate loans, it is the customer who takes the risk of fluctuation in interest rates. Fixed rate loans are more expensive than variable rate loans. Almost 90 per cent of the existing housing loans in India are said to be under floating rate schemes because lenders generally discourage fixed loans by charging exorbitant rates compared to floating rate loans. Typically, fixed interest rates are higher by about 100-300 basis point over the floating rates. Most banks charge a premium of 1 to 3% for fixed rates over the variable rates. In a low interest rate regime (when the interest rates are at a rock-bottom and there’s a high possibility of a rate hike), fixed rate seems to be a better option as it locks in your future EMIs and you are hedged against interest rate hikes in future. It makes sense to lock in the loan at lower interest rates rather than pay higher rates in future. Conversely, floaters are best suited in a falling rate scenario. In other words, in case the interest rates are already too high (as is the current situation) and there’s a high probability of future decline in the interest rates, you should opt for floating rates. In an era of falling interest rates, floating interest rate borrower have a party time. 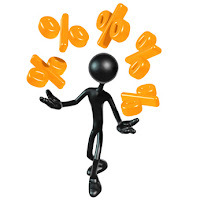 If you opt for a floating rate loan you stand to gain if the interest rates decline. On the flip side you will lose out if interest rate rises. Remember that floating rates are more risky than fixed rates. Tenure of home loans ranges usually from 10 to 20 years whereas interest rates movements (which depend on a host of macro-economic factors) are cyclical in nature and it’s impossible to predict beyond 2-3 years. But having gone up substantially and almost reached the peak (coupled with slowing down of the economy) there’s high probability of southward movement in the interest rates in the near future. Under a special government driven scheme -- to provide a boost to the struggling realty sector -- from today (December 16, 2008) onwards, all public sector banks have lowered the interest rates on new home loans up to 20 lakh and it is expected that private sector banks and housing finance companies will follow suit (to stay competitive they don’t have any other option). This is just the beginning. In near future, you can expect more downward pressure on property prices and softening of interest rates as real estate sector is suffering from one of the worst slowdown in recent times. And with interest rates and property prices south bound, ‘wait and watch’ approach is recommended for prospective home loan borrowers. However, if you have decided to go ahead with your housing purchase decision, I would recommend that -- keeping in view the current high interest rate scenario -- you sign up a floater so that you can benefit from future reduction in interest rates. Would love to read your write-up/advice on deciding on "Refinancing an Existing Home Loan"